miniOrange provides a ready to use solution for Office 365/Sharepoint. This Single Sign On solution ensures that you are ready to roll out secure access to your users to log in into Office 365/Sharepoint. Office 365 is a suite of applications which consists office applications as well as cloud related services that are enabled over internet. Office 365 business plans include services like web conferencing and email services for business. Sharepoint is a web-based collaborative platform which is integrated in office 365 suite. It is a platform for various programs. It is a backend system that ties your employee PCs and mobile devices together, allowing them to interact and synchronize their efforts. Sharepoint allows the employees for enterprise users to save their documents and access them centrally for better business. miniOrange provides Single Sign On (SSO) to any type of applications whether they are in the cloud or on-premise. With Single Sign-On, Office 365 can put its existing trusted IdP in charge of the authentication process. Active directory is configured as identity source within miniOrange, which is set as default identity source. Due to this authentication will happen against active directory credentials and appropriate user attributes such as immutable id will be fetched upon successful authentication against Active Directory credentials. After configuring the identity source, users present in Active Directory can login into the end user dashboard through their Active Directory credentials. In case user does not exist within miniOrange, the user is created on the fly and configured directory attributes are fetched and stored in the user profile. User is created on the fly so no need to manually create user in miniOrange. Users can configure 2 Factor Authentication as part of the sign-on process. miniOrange supports 15+ two factor authentication methods. This functionality works only in case customer branding is set, so, you need to setup own branded URL. 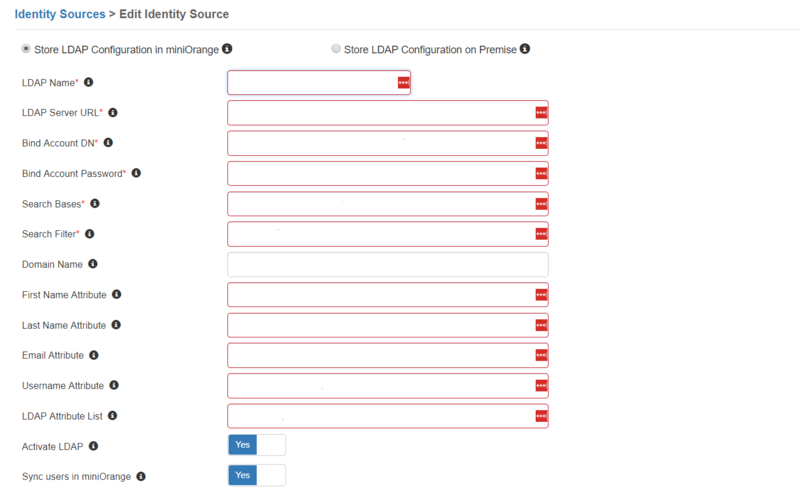 Adding LDAP Identity Source in miniOrange. 1. Navigate to Identity Sources in the miniOrange admin console. Select type as LDAP. Note: Save the service account password. The Activate LDAP and Sync users in miniOrange options are to be selected in order to support User creation on the fly. Add Office 365 Application in miniOrange. 1. Navigate to Apps->Manage apps in the miniOrange admin console. 2. Select Office 365 as a SAML App. Configure Office 365 for federation with miniOrange as IdP. Set-MsolDomainAuthentication -Standard -DomainName "##DOMAIN NAME##"
Replace the appropriate values for IDP Entity ID, SLO URL, SSO URL and Certificate. Add External URL for Sharepoint App in the end user dashboard. 1. Navigate to Apps->Manage Apps. Click on Configure Apps. 2. Select Create your own app->External App. 1. Navigate to the branded login page. 2. Enter the following credentials like user name and password. 3. User gets created with the username of miniOrange and email of gmail account. 4. The links to Office 365 and Sharepoint app appears on screen. 5. Click on these in order to get logged in into Office 365 and Sharepoint respectively.